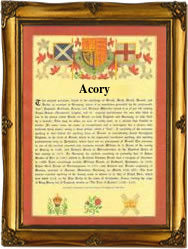 Recorded as Ackary, Ackery, Acary, Acory, Akery, Eckery and others, this is an Emglish surname. Curiously however spelt, it is what can only be described as a dialectal of the famous Hebrew surname 'Zacharias', or as it is usually recorded in Medieval times Zachary or Zachery. Meaning 'God has remembered', although Hebrew in origin, this was not as a European name, Jewish. It was introduced by returning Crusaders and other Christian soldiers and pilgrims from the Holy Land, in the 12th century. It was used firstly as a personal or given name, in the course of time becoming a (christian) surname. The personal name is first recorded in England in the Feudal Documents of the county of Durham in 1155, with that of Acharias filius Copsi, the first surname recording being shortly after, with that of Robert Akari of Huntingdon. This is in the Curia Regis rolls of 1199. 'Modern' examples of the surname taken from surviving church registers of the city of London include Phillipe Akerrye who married the exotically named Harrye Wellp (as spelt), at Christ Church Greyfriars on May 11th 1548, Thomas Ackery, christened at St Sepulchre church, on January 11th 1682, and John Ackery whose daughter Rebecca, was christened at St Matthews Bethnal Green, on February 9th 1755.